I’m sure by now you’ve figured out where this is headed. We have entered Autumn and with that comes a new array of beers. I’m sure we all noticed that pumpkin beers no longer seem to be coming out in September and October and are instead fighting for shelf space as early as June and July. Christmas decorations are already going up in your local department store. Kids are already telling parents what they hope Santa brings them. Like all things in life, the holidays are coming faster and faster. Since there is very little you and I can do about it, we might as well embrace it. Back in August, I touched a little on using spices and additions in your beer, however kept it mostly tied to the saison style. Here we’ll discuss a few other styles and flavors we can use. The Fall season is upon us and with it a heavy handed approach to traditional mulling spices. 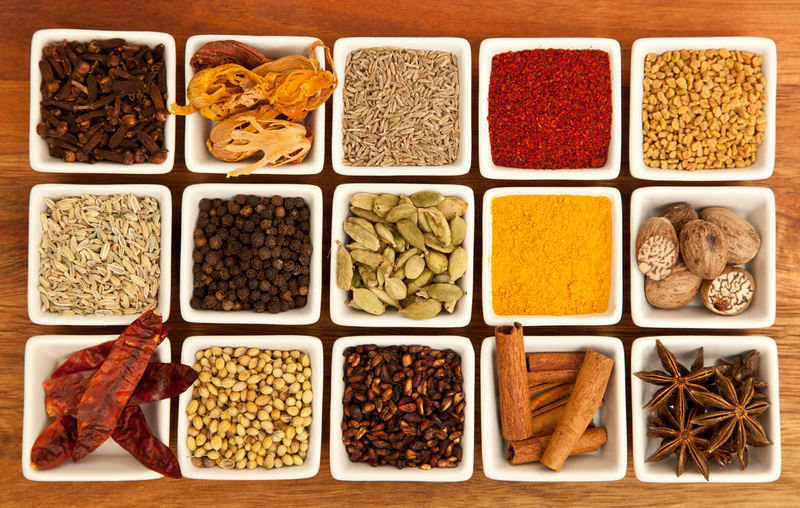 Mulling spices range in intensity and flavor and can be any combination of spices that may include: cinnamon, cloves, allspice, ginger, nutmeg, vanilla, cardamom, anise, peppercorns, citrus peel; and even edible flower petals. Most spiced beers in this season stick to one main group of spices: cinnamon, ginger, nutmeg, allspice and cloves, or when combined, simply pumpkin pie spice. It is after all pumpkin pie spice that gives pumpkin pie it’s trademark flavor and aroma. You’ll actually find that even if your can of pumpkin pie filling says 100% pumpkin, it’s probably just squash. Pumpkin/Squash is relatively flavorless when you get to the meat of it (see what I did there? ), so spices are needed to dress up the profile. Cinnamon, cloves, allspice, ginger, nutmeg, vanilla, cardamom, anise, peppercorns, citrus peel; and even edible flower petals are all commonly found in mulling spices. So what do you do when it comes to making a beer with it? Well, it really depends on the style of beer you are making. If your base beer is a pale ale and your goal is to have a nice smooth mouthfeel with ramped up pumpkin flavor, you may want to include both pumpkin and pumpkin pie spice. As most pale ale’s don’t have a lot of body to them. The pumpkin meat will really help fill out the profile here. Be sure if you use additional spices, that your pumpkin pie filling is not pre-spiced! These are strong spices, and a little bit goes a long way. If your base beer is a stout or porter, it’s probably best to leave the real pumpkin in the cupboard and just rely on spice additions as body usually isn’t a concern with these styles. Slow down, pilgrim. If you are making a beer with pumpkin meat, be sure to give your carbonation schedule plenty of time. While most beers will achieve proper carbonation in 2-3 weeks, the enzymes in pumpkin can slow down the process by as much as 300-400%!! Be sure to give your beer at least 4-6 weeks to fully carbonate and bottle condition. Personally, due to oversaturation I grew tired of pumpkin beers. I’ve opted for a different fall spice, and I’ve fallen in love. Chai is a completely unique flavor from pumpkin pie spice, yet is almost identical. In fact, the only difference is the addition of cardamom, a spice native to India. I find that cardamom helps tone down the intensity of the clove and ginger, and allows the cinnamon and allspice to play a bigger role. I’ll be sharing my Chai Milk Stout recipe later in this article. Winter spices move us slightly away from the traditional intense mulling spices, and bring is more into the fruit and caramel side, while sometimes mixing in some of the components from the mulling spice side and vanilla. Think gingerbread or mixing cinnamon and vanilla with berries and citrus. Since winter usually brings us warmer, stronger and darker beers, we really have a lot of room to play here. One recipe I wrote up, and have yet to brew, is a take on those dark chocolate oranges you see around the holiday. It’s a great way to mix American citrus hops, dark chocolate, orange peel, and roasted malts. Another avenue you can take during the winter time is a Belgian holiday ale which you may find is as simple as taking a solid dubbel or tripel recipe and adding some spices that you hadn’t considered such as anise or cloves. Don’t be afraid to play with other fruits such as raisins, figs or even plums. Just like hops, spices need to be added at a certain time. We aren’t making a sauce here. The longer you boil them, the more you’ll kill off the flavor and aroma they provide. Really, we just want to make sure they are free of contaminates. This can be done 1 of 2 ways, or both. 1. Add them to the final 5-10 minutes of your boil and give them a good continuous stir until they are as dissolved into your wort as you can get. If you are using something like star fruit or cinnamon sticks and want to take them out before you go to primary, use a mesh or muslin bag so they can be removed separately. 2. Turn them into a tincture by adding them to vodka (bourbon will also work if you want some additional flavor), then add it to secondary (fruit and spices) or bottling bucket/keg (spices). Usually .5 – 1 oz of alcohol is more than enough to kill off any lurking bacteria. As promised, here is the recipe for my Chai Milk Stout. It’s great for sitting by a fire on a cold night, great for dessert, or even paired with a cigar. The spices blend well with the roasted backbone and the lactose sugar provides for a nice smooth mouthfeel, without being cloyingly sweet. Mash: Single Temp. Infusion – 152°F for 60 min. 1 lb. – Lactose (Milk Sugar) @ 10 min. 1 oz – Williamette @ 60 min. 1 oz – Williamette @ 30 min. 1.50 tsp – Ground Cinnamon @ 5 min. 1.25 tsp – Ground Ginger @ 5 min. 0.25 tsp – Ground Nutmeg @ 5 min. 0.25 tsp – Ground Cardamom @ 5 min. 0.25 tsp – Ground Cloves @ 5 min. 0.25 tsp – Allspice Powder @ 5 min. All spices listed above, halved. Create tincture with .5 oz of vodka and add to bottling bucket or keg. If your tincture is not smooth and won’t mix well with the beer that is racked onto it, add a bit more vodka until it is. You don’t want this sitting on the bottom, unmixed. i want to try doing a pumpkin wine. What does it taste like? Howard, the funny thing about a lot of the exotic wines is that they don’t really taste much like the source ingredient. Take Banana Wine for instance. You would think the traditional banana character would carry through to the finished product. What you actually end up with is a very clean tasting white wine, often confused for a very high quality white grape wine. You’ll be equally surprised to learn that pumpkin wine yields very similar results. Your end product will taste very much like a chardonnay. Due to the proteins and enzymes in the pumpkin, it may end up with slightly more mouthfeel than grapes, however I don’t think it’d be overly noticeable. Now, you could spice the wine of course, if you really wanted that flavor, but I’d go very low on the additions. Always better to add before bottling and taste and adjust first. Remember, pumpkin pie spice packs a lot of flavor and a little bit goes a long way. I was wondering if blending it with a small amount of ginger wine would be a plus?